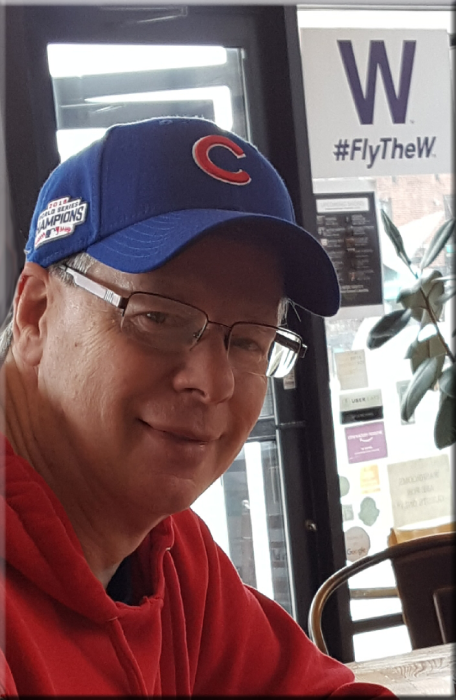 Thomas Russell Wayman, 59, of Burlington, died at 10:05 PM Thursday, October 25, 2018, at the University of Iowa Hospitals & Clinics in Iowa City. Born January 16, 1959, he was the son of Charles Russell and Dorothy Farrell Wayman. On September 4, 1982, he married Leslie Gilmer of Rolling Meadows, IL. He started his career in the grocery industry at Eagle Foods and more recently worked at the Hy-vee in Burlington. Thomas was an avid Chicago Cubs and Bears fan. He enjoyed classic rock, reading and WWI and WWII history. Most of all, he loved spending time with his family, especially his granddaughter Paisley. Survivors include his wife, Leslie; one son, Brandon Wayman of Red Wing, MN; one daughter, Lauren (Adam) Moyers of West Burlington; granddaughter, Paisley Moyers, and one grandchild on the way; one brother, Mike (Nancy) Wayman of Maricopa, AZ; one sister, Candy (Don) Olson of Anchorage, AK; three nieces and three nephews. The family will receive friends from 4:00 PM until 5:00 PM, Thursday, November 1, 2018 at Prugh~Thielen Funeral Home. The memorial service for Tom will be 5:00 PM Thursday, November 1, 2018, at Prugh~Thielen Funeral Home with Rev. Ryan Cosgrove officiating. A memorial has been established for the Des Moines County Humane Society. Thomas Wayman Funeral Service from Prugh~Thielen Funeral Home on Vimeo.